As relatively inoffensive as this bit of instantly forgettable claptrap is, it draws attention to an increasingly worrisome trend that’s been rearing its ugly head more and more frequently in FW as of late, that being TomBan’s incessant bullying of this Wedgeman character. He seems to be taking a little too much delight in these constant attacks on Wedgeman, who’s never there to defend himself I might add. We know that Wedgeman is battling a serious physical deformity, we know he’s been reduced to stealing pills to fuel his drug habit yet in spite of this he’s a star varsity sporto, a hit with the ladies and scheduled to graduate this year. So why is BanTom using this rarely-seen character as his personal whipping boy? He should take the time to think things over and reflect on what might have been if HE’D been born with huge excavator bucket-like hands and Wedgeman was the one with the boring comic strip. Coming next month: the anxiously-anticipated anti-bullying arc that never really happened finally debuts in shocking fashion, as TomBat draws himself in his own strip where he tearfully apologizes to Wedgeman right before the climactic SJ high school graduation scene and expresses remorse about his shabby portrayal of him in his strip. Wedgeman tries shake his hand and accidentally cracks BanTom’s ribs with his colossal freak paw and another better cartoonist draws the strip for a while like that other time. Tens of regular FW readers don’t particularly notice or care. And the point of this strip is…what? Is this proof that BMOC Wegdeman is really disliked by everybody and just doen’t know it? In that case, who’s really the bully? Who really needs help from his teachers to grow up to be a healthy person? Just saw your post after I posted my similar observations. Couldn’t agree more with your analysis. Wait a minute…you mean Tom Batiuk passed up an entire week of science puns? Saints preserve us. As for Wedgeman, it sure seems odd that he’d be the last to leave the museum, since he exhibits no interest in such things…or anything, near as I can remember. He’s probably in the restroom, isn’t he? So, it’s okay to insult kids as long as their teachers are in on it, too, and you do it behind their back? That’s what I learned. Wedgeman has one thing going for him, at least, that Kablichnick is coordinating this trip. Les or Linda would have just left him. They’d leave Owen and Cody too if they they had the chance. It’s not enough to hold an eternal grudge against the kids who were mean to you in school; you have to pretend that everyone else hated them too, including the teachers. Let’s say there are FW readers out there who follow the strip but don’t necessarily read it every day. OK, OK, I know. Just f*cking imagine they exist then and humor me. How many times has Wedgeman actually appeared in the strip? I mean individual panels with Wedgeman in them, regardless of what he was doing. I’d guess maybe twenty, if that. So unless you read FW every day there’s a better than fair chance that you have no idea who Wedgeman is. So my point is: if you’re an occasional reader and you check out Monday’s strip to see what the lovable band of merry makers are up to this week and they’re cracking wise about a character you’ve never heard of, what’s stopping you from saying to yourself, “meh, screw this, no idea what’s going on here”? It not only doesn’t attract readers, it actively repels them away. And just the other day someone told me this thing’s been running for over forty years on this formula. It doesn’t get any better on the other side. Here, we have constant abuse of a straw man. On Crankshaft, we have a confused old woman who’s lost the will to live and that’s hilarious. F’chrissake, T-Bats has been out of high school for almost fifty years by now and he’s STILL whipping on the pretty girls who shot him down and the affluent sportos who knocked his sketchbooks out of his arms in the hallway. The last time Wedgie made an appearance (as in, actually showed his face) was when Owen was taunting him during class ring sales. Yeah, he used to be a bully before the AV Club dropped a dime on him and got him suspended from the football team. Wedgeman hasn’t been seen bullying (or doing much else) since, but that doesn’t stop T-Bats from piling on him. But just being a jock and having enough money to buy the biggest Cadillac of Senior Class Rings is enough to keep the “jokes” coming. I’m betting Wedgeman is in for more humiliation this week. Maybe The Gang will find his head stuck in a urinal, or he’s being held by Science Center Security for trying to boost a toy dinosaur out of the gift shop or something. Whatever it is, you know it’s not going to be subtle and it’s going to take a week of flogging to resolve. Don’t school use the buddy system, in which each kid is assigned a buddy, on these field trips so they don’t stray away? And why am I suddenly afraid that somebody will find Wedgeman’s body in a bathroom, dead of a overdose? Because this this the Funkyverse, that why! Okay, wasn’t Les supposed to be getting ready to take the seniors on a trip to Washington DC? WTF with this Science Center stuff and Kablichnick? The class field trip was a trope that Charles Schulz often used with great results. One time he had a plot where the Peanuts gang confused a supermarket for the museum. It was a ridiculous premise but Schulz took it all the way to where Peppermint Patty did a report on the produce aisle. Another involved Linus seeing a girl he was fond of and ended with Woodstock rescuing Linus from a rooftop “Nam style. I’m bringing these up because it really shows how poorly the art has fallen with this strip. Batiuk doesn’t even attempt to write something interesting. He does not give two shits about entertaining the reader. Unless Wedgeman is found chopped up in alley, I’m going to call this the poorest effort on Batiuk’s part. 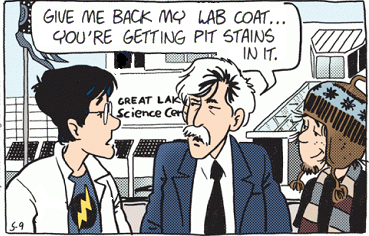 @$$$WESTVIEW ONCOLOGIST$$$: Bill Watterson also used the “field trip” trope with good-to-great results. I think Jef Mallet (the guy who does “Frazz”) also has used it successfully. It’s a pretty much inherently funny set-up, because school field trips, while usually not total disasters, almost always have something go wrong. Bus drivers get lost, or get stuck in cul-de-sacs when trying to “shortcut” around traffic; trips intended to do something outdoors (like research a state park ecosystem or photograph the downtown architecture) invariably attract “Surrender Dorothy” weather; and sometimes the attraction that was the whole point of the trip isn’t open (my high school government class traveled 200 miles each way to visit the capital and see Our Government In Action; of course the legislators decided to take the day off and all we saw was the empty chamber–Government In-Action, as it were). And so forth. This is what you get when you try to be “clever,” young man. Remember that if you’re ever tempted to write a comic strip that’s overly dependent on puns. And enjoy riding back to Cancerdeathville on a Continental Travelways bus that reeks of urine. The one character we’d all really like to leave behind in the science museum. A week of “Funky” snark strips wouldn’t be complete without a “Starsuck Jones” reference, so here it is. I’m done for the day now. I promise.